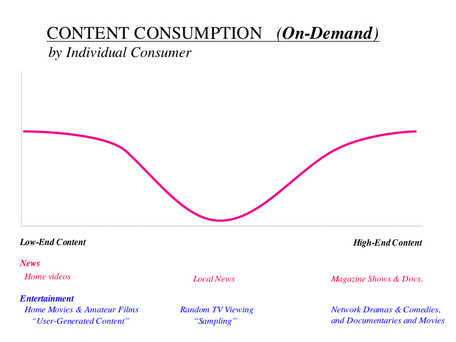 Contrasted against the old pattern of media consumption in the pre-VOD world, the concept of The Curve shows us just how dramatically a significant aspect of our video consumption has changed. As you'll see, the two patterns actually mirror each other. In brief, we've gone from a world that consumes a limited amount of high-end and low-end content, i.e. a world that consumes mostly content in the middle (simply because that's what makes up the majority of content available live on TV at any one moment), to a world that consumes primarily high-end and low-end content, a world in which the middle completely drops out. The two curves completely mirror each other. And all of that has a good deal of significance for content producers, programmers and distributors. A Textbook Example of "Disruptive Selection"
The curve on the bottom-right—the curve labeled "Disruptive Selection"—looks pretty familiar, doesn't it? It's rather remarkable how the curve for what biologists call "Disruptive Selection"—i.e. 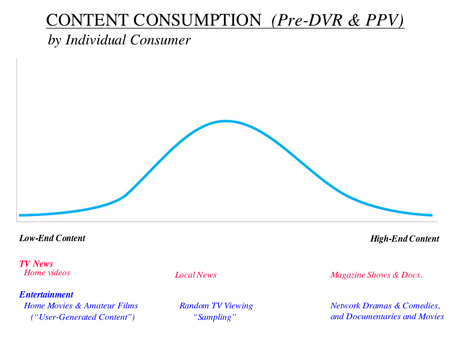 the relationship between the pre-disruption and post-disruption evolutionary curves—matches up with The Curve for content consumption created by the technological disruption caused by VOD, PPV, YouTube, et al. Once you think about it a bit, though, it makes a lot of sense. Technology truly is disrupting the evolution of media, and the pattern of that disruption looks no different than it does in the biological world. It's always interesting when human behaviors in the aggregate match biological imperatives.